People usually use AdWords Conversion Tracking code that they place on the specific page they would like to measure. For example to measure successfully registration they will place AdWords Conversion Tracking code on the “Thank You for registration” page (some time ago it was the only way to receive AdWords conversions data). That’s quite good solution but sometimes it just isn’t enough… What about single page application? What about some extra metrics that can help to optimize your campaigns? Instead of using standard Google Adwords conversion tracking API, we recommend to use powerful Google Analytics Events feature for AdWords Conversion Tracking. Note: In this example i’m using Universal Google Analytics API. More information can be found here and here. Events as Goals: Remember to setup proper events for your Google Analytics Goals so that our registered events can become goals and can be later used for conversion tracking in Google Analytics and Google Adwords. Imported goals will be listed below with proper data. 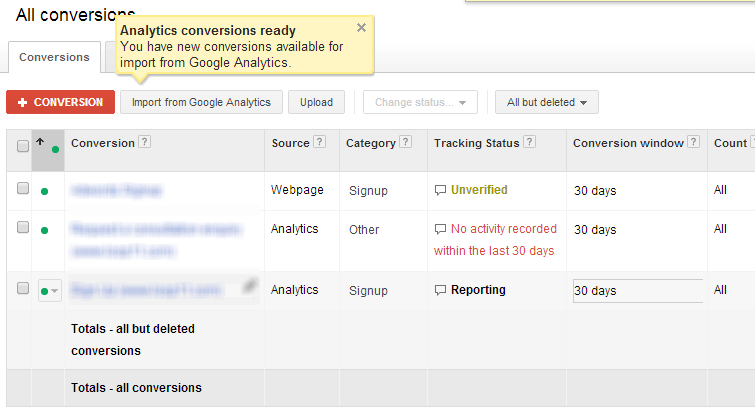 Notice: If you want to track new events in Google Adwords, you will need to create proper goal in Google Analytics first. For more information there is great Developer guide. Important: In this example i’ve used very simple PHP implementation of GA class (there are also many different well documented and tested PHP libraries in Github for Measurement Protocol Client). Registering events on the server side is really useful for example when we want to register / track some transactions which are processed by CRON scripts or any other action that cannot be executed in the browser. In this way we can also register some Google Analytics ecommerce transactions or social interactions. It’s now also possible to do server side AdWords conversion tracking, check https://developers.google.com/adwords/api/docs/guides/importing-conversions for more details. I’ll check this out. Thanks for letting me know!